ABOVE: A vintage Polybahn car (now retired). Z�rich is a city of hills, including a steep one that climbs from the east end of the Bahnhof bridge across from the main train station. High on the hill, overlooking the Old Town and the River Limmat, are two college campuses: the University of Z�rich and the Federal Institute of Technology, also known as the ETHZ, Polytechnikum, or "Poly." Getting to the campuses can be a chore, especially for students or professors who are laden with books. Recognizing the need for a mechanized shortcut, the Zurich city fathers granted an 80-year concession for a Z�richbergbahn in 1886. 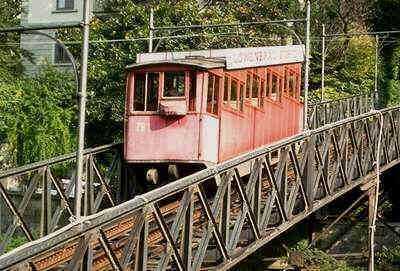 The funicular railway was completed in 1889 and has been known colloquially as the "Polybahn" ever since. The Z�richbergbahn whirred and clanked its way uphill without incident until 1966, and the concession was extended by ten years. Then came the bad news: In 1976, the Polybahn's management announced that it didn't have enough cash for a badly needed overhaul of the system. The Union Bank of Switzerland came to the rescue, establishing a new business called "UBS Polybahn AG" that took over the concession.The new UBS subsidiary completely restored the track and renovated the Polybahn's two funicular cars in just 12 weeks. In 1990, the Polybahn established a reciprocal fare arrangement with Z�rich's public transportation network, and ridership climbed to an unprecedented 1.6 passengers a year. It was time for another system overhaul. This time, the cars were replaced by slightly larger versions that boosted capacity by 25%, to 50 passengers every three minutes or 1,000 passengers an hour. The Polybahn is a funicular railway, consisting of two cars that are connected by a cable. The two cars are designed to counterbalance each other like a pair of old-fashioned elevators. As the car on the left climbs the track, the car on the right descends. They pass each other in the middle, with the left car reaching the upper station as its twin arrives in the lower station. The cars then discharge their passengers, collect new payloads, and repeat the three-minute cycle. Hours of operation are 6:45 a.m to 7:15 p.m. on weekdays, 7:30 a.m. to 2 p.m. on Saturdays, with departures every two to five minutes. Closed Sundays and holidays. Michael Az�ma's page includes a photo, a map, and technical information. This attractive site has a history of the Polybahn, technical data, and plenty of large, up-to-date photos. You can decipher the German text with Google Translate.